Hair extensions are a popular and effective way to add volume and length to your hair instantly. Both celebrities and individuals alike are choosing to enhance their beauty with hair extensions to create gorgeous hair. While extensions can be installed relatively quickly and removed easily, they do require some basic care and maintenance to keep them looking their best. Your hair extension installer will generally provide you with a care and maintenance plan tailored to your situation, however the following information is also provided as a reference to supplement their knowledge and advice. Issues such as tangles, bond failure, dryness and shedding can almost always be attributed to incorrect installation, poor maintenance, colouring or incorrect care and as such should be discussed with your hair extension installer should they occur. Clip in extensions are a popular alternative to semi-permanent extensions, requiring far less maintenance and commitment. They can be applied at home by yourself or with instruction from your hairdresser/hair extension professional, and can be put in and taken out within minutes. Clip-in extensions also do not need to be washed as often as your own hair. Semi-permanent hair extensions come in different types and weights and are applied using different methods. Weights of each extension can vary between 0.5 grams and 1.0 gram per extension. Your hair extension professional will judge which weight extension to use and there distribution throughout your own hair. It is important not to place too much weight onto each section of your hair, thus correct distribution is very important. The quantity of extensions can vary depening on the desired hair style, length, fullness and condition of your own hair. For a full head of extensions in .5g, 8 to 10 packs/bundles are the average amount used. For a full head in the .75g to 1g extensions 100 to 120 extensions are the average amount used. More extensions can be used for a fuller look and less for a style with less volume or to create highlights/lowlights in a clients hair, using extensions. The heat method, fusion method and bonding method is an application process in which heat is applied to the keratin tip (U tip/nail tip) and the extension is thermally bonded to a section of the recipients hair. They can be removed using liquid hair extension remover. Prior to installation using this method, hair is normally washed using a clarifying shampoo to remove any build up. Micro rings (also known as bead extensions) are applied using individual rings which are crimped to attach the extension (I tip/shoelace tip). They are removed by gently squeezing the ring in the opposite direction, thus releasing the extension. Micro rings come in a variety of colours and types including plastic coated metal, copper with silicon inserts, etc. Micro rings and heat bonding are both popular and durable methods of attachment, used depending on individual preferences of the hair extension professional. Tape extensions (also known as skin weft) are quick to apply and can be used to add length, fullness or panel colour to your clients hair. They spread the weight of the additional hair, so can be a lighter alternative to tranditional micro bead and bonded extensions. One global colour can be used for the entire application or colours can be mixed (darker colour underneath the “sandwich” and lighter to the top) to add tone and depth. It is not recommended to colour tape extensions as this can damage the bond. They require carefull application to ensure they are firmly adhered and can last weeks depending on application and care. Incorrect application and care can result in them coming out prematurely. Additional tape is availabe for retapping/reapplicaton. Your clients hair needs to be very clean prior to application. Shampoo hair 1-3 times with a clarifying shampoo and dry thoroughly before application. Do not condition or use styling products, prior to application. Take a very fine section with a tail comb, gently lift the cover paper from the tape extension, placing one tape extension on top and another underneath (like a sandwich). The section taken needs to be fine enough to see through and for additional adhesion, leave a small area on the outside edges of the tape extension peice with no hair between. Firmly pinch together the sandwich lengthways portion by portion to ensure they are firmly held together while shaping the sandwich to a gentle curve to fit the clients head shape comfortably. Each tape extension should be firmly pinched together in this manner for a total of 1 minute. Extensions are placed in a brick work pattern leaving space between both horizontally and vertically. For comfort and for the tape extensions to sit naturally, placement should leave enough space at the crown, nape and ear regions. Conditioner, treatments, serum or styling products should not be used, after application, anywhere near or above the bond as they can disintegrate the tape and remove adhesion. Hair should be washed no more frequently than every 2-3 days, using a sodium free shampoo and conditioner. The scalp should be gently massaged rather than rubbed or scrubbed. Conditioner should be applied past the hair extension bonds. A satin pillow case is recommended to avoid knotting. Tape extensions are able to be removed, prepared and retaped ready for reapplication. Tape extensions are not sutiable for clients who sweat profusely or swim regularly due to excess moisture, salt or pool chemicals detoriating bonds prematurely. 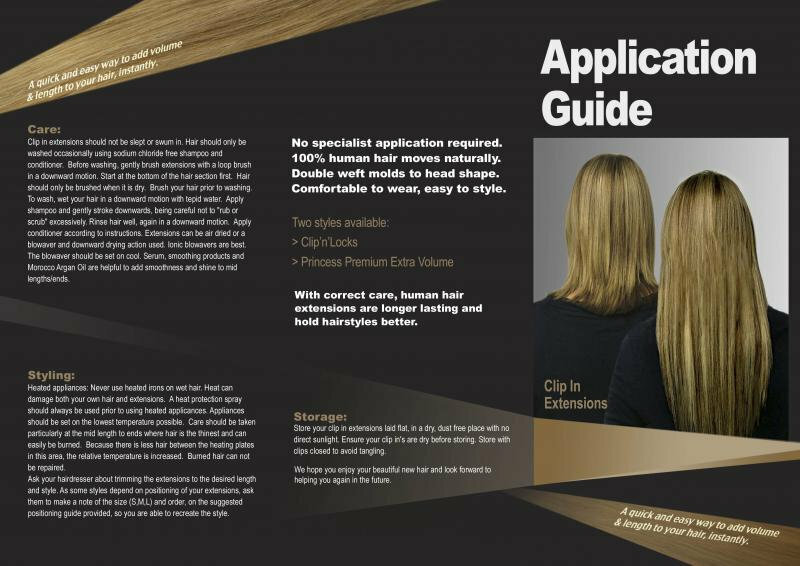 For full application instructions and tips click here to see our hair extension courses. It is important to select the correct hair care products to use with your extensions, as the wrong products may dry out, entangle or otherwise damage your extensions and bonds. A gentle shampoo and conditioner are essential for proper care of hair extensions. Sodium Chloride free shampoo and conditioners are preferable. Leave in conditions, serums, smoothing products and Morocco Argan Oil are helpful to add smoothness and shine to mid lengths to ends. Regular hair treatments can help add moisture. Be careful with using products/heat on attachment points/bonds. See the note above on products. Hair should not be washed more frequently than every second day. Hair washed too frequently will tend to dry out quickly. When hair extensions have been installed using the heat method or tape method, hair should not be washed for 24 hours afterwards, to allow for the bonds to set. Before washing or wetting your hair it is important that you brush your hair first. A loop brush designed for extensions should be used. A comb should never be used on dry hair nor should a brush be used on wet. Start at the bottom of your hair and work your way up when brushing. Brushing your hair prior to washing is essential, otherwise you could be adding water to a knot which can be impossible to get out. Wash your hair in a downward motion, with your head upright allowing water to flow downwards, using lukewarm water - not hot. Do NOT wash your hair upside down. Apply shampoo and gently stroke in a downwards motion being careful not to “rub or scrub” excessively. Rinse hair well, again in a downward motion. Apply conditioner according to Instructions, avoiding attachment points. The hair can be gently combed with a wide tooth comb from the bottom up at this point. Again, rinse in a downward motion. Hair is cleansed on the roots. Conditioner is for the mid lengths to ends. Gently blot hair with a towel to absorb excess moisture and let it air dry for 10 minutes or so before using a blowaver. Alternatively, let the hair completely air dry. Never use heated irons on wet hair. Heat can damage both your own hair and hair extensions. A heat protection spray should always be used prior to using heated appliances. Heated appliances should be set on the lowest temperature possible. Care should be taken particularly at the ends with straighteners as hair is thinnest here and can easily be burned as there is less hair between the heating plates which increases the relative temperature of the irons on the hair. Bonds should not be touched with heated irons. Burned hair cannot be repaired. You can dry your hair as you normally would, though an ionic hair dryer is best. Any type of colouring or chemical treatment will be detrimental to the condition of your extensions and bonds and is not recommended. If you are going to colour your own hair it is better to do this prior to having extensions installed and matching the extensions to the desired hair colour. Should you decide to go ahead and colour your 100% human hair extensions, it is essential you check your hairdresser/colourist is experienced with colouring extensions and is aware of the difference between colouring hair in its natural state and colouring hair extensions. Hair extensions have gone through several chemical processes during manufacture such as sterilizing, lightening and colouring. Because of this it is essential colour principals/rules are followed as well as additional consideration being given to the chemical process the extensions have previously gone through. Do a strand test prior to colouring, every time, to ensure desired result will be achieved. Lightening extensions is not recommended as generally they have already been pre-lightened during processing. When a darker shade is desired on extensions with a colour level from 6 through to 10, red or gold pigment should also be added to the mix for filling. If pigment is not added, there is a danger of a green reflect showing through. If you decide to colour without pigment being added, and the result was a green reflect, do not try and lift this, as the process will reverse and the result would be a pink effect. Strength of developer used normally ranges from 1.5%, 3% & 6%, with higher strengths being avoided as they can excessively damage the extensions. Your hair needs to be brushed using a loop brush at least twice a day. If not, you will notice matting, breakage etc. Brushing starts from the bottom up. If you start any higher in your head you will just be brushing more hair into a previously started knot. A hand can be placed palm down on the bonds and the other hand on the brush to support the bonds to avoid excessive shedding. As your hair grows brushing will be an important part of your maintenance. Leave in conditioners, serums and smoothing products are also helpful for mid lengths to ends. Swimming, chlorine and salt water can cause hair extensions to get tangled and matted and can damage bonds as can “hard water” and water temperature. Tie back your hair in windy conditions and braid it at night to avoid tangles. Extremes such as freezing conditions can also be detrimental to bonds/hair. 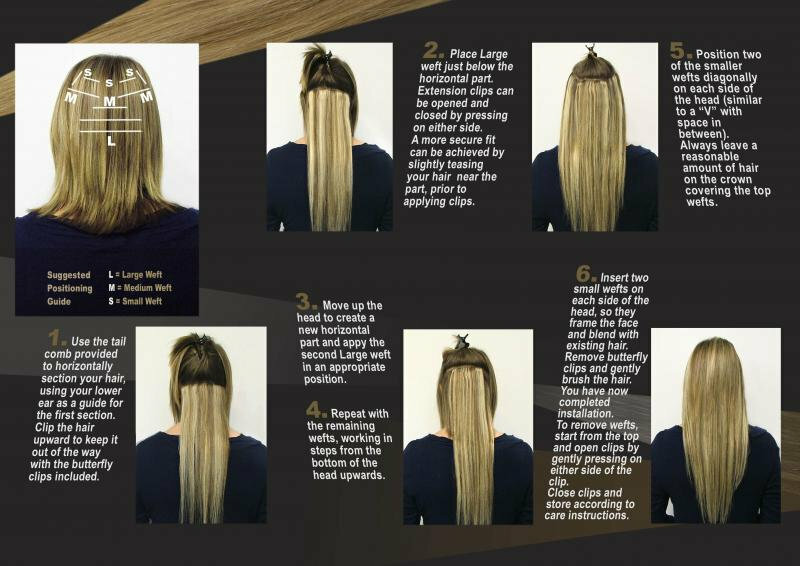 Hair extensions are often cut horizontally after application to neaten the ends. Thinning of extensions, razor cuts or pulling can cause them to shed and/or frizz because of the loss of weight of hair or blunt razors being used. When having extensions cut be sure your hairdresser is aware of the proper methods to use. Never go to bed with wet hair. It is a good idea for both your hair and face to invest in a silk pillowcase. It is also suggested that you wear a low braid with a soft scrunchie so that your hair doesn't get tangled. Don't forget to brush hair before bed. It is very important that you treat your hair extensions as an investment. This means that if you want the "life" out of your hair you need to take good care of it. Always follow instructions given by your professional installer and talk to them about any questions you may have.